In the Philippines during World War II, a girl is rescued from bandits by a guerrilla fighter. 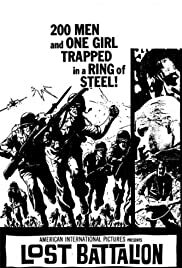 200 Men and one girl trapped in a ring of steel! Lost Battalion can't decide what it is: it starts out with stock footage accompanied by documentary style narration, turns into a war drama, and ends up as a love story with tragic consequences. Shot in The Phillipines by the prolific Eddie Romero, the film benefits from location footage but is let down in the story department, as the Japanese invaders are little more than a footnote to the Diane Jergens/Leopoldo Salcedo romantic storyline. Sadly the film cannot bring itself to allow an 'interracial' relationship to flourish, as only one of the loving couple survive the film (I'll let the reader try to guess which one it is). Technically the film looks okay--once the stock footage padding is out of the way (the filmmakers even represent Japanese soldiers with film of American marines in action!). Cinematographer Felipe Sacdalan, a Romero regular and FAMAS winner, manages a few artful and elegant shots amidst the jungle, and top acting credits go to Johnny Monteiro as the rebellious Bruno, a colourful character who seems to have strayed into this film after leaving the set of Treasure of Sierra Madre. Nothing special overall, but a strange little film with minor interest nonetheless.